"...These stories connect readers with their own ability to hear and activate them to walk in this gift in everyday experiences. The Word of Knowledge in Action is a timely book, as God is releasing His Church in a fresh and powerful way of bringing people into an experience with God." Discover how the spiritual gift of a Word of Knowledge can impact your world! The Word of Knowledge in Action is the first book completely dedicated to a comprehensive, biblically sound analysis of this spiritual gift. More than that, through testimonies and biblical examples, you will find page after page of rich, practical advice for implementing this gift in the context of supernatural Christianity. Discover how the Holy Spirit reveals Jesus Christ through you. Integrate the spiritual gift of a Word of Knowledge with multiple other spiritual gifts and ministries. Steer clear of some of the most sinister pitfalls that the enemy uses against people who exercise this spiritual gift. Realize the simplicity of exercising this spiritual gift through tested advice and practical application. Experience the supernatural power of the Holy Spirit as you put the principles of this book into action. 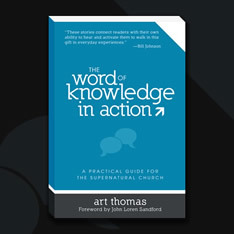 Through personal experience, practical counsel, and biblical revelation, author Art Thomas brings this special spiritual gift to life in a whole new way by citing tested and proven strategies for integrating the Word of Knowledge into your everyday Kingdom life. With clarity, wisdom, and simplicity, the Scriptures are presented in fresh, vibrant ways—bringing revival to all who will receive. © Copyright 2011, Art Thomas Ministries.